Thank you for joining me today, I am sharing my good news of being promoted. This happened in October but this week I received the certificate. 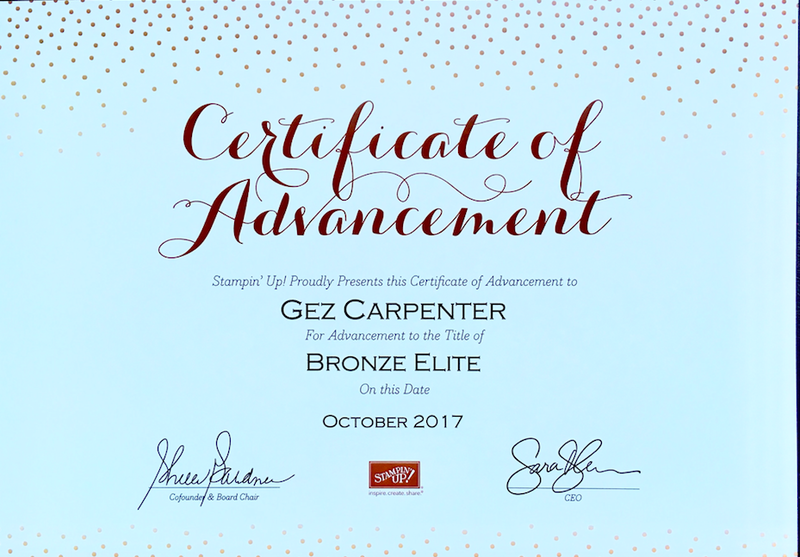 I was very excited when I received my certificate from Stampin Up for reaching Bronze elite. I can't wait to frame it and display it in my craft room. It is really nice to be recognised in this way. I find the Stampin Up ‘family’ to be a really supportive community where everyone supports and applauds each other's achievements and helps out when they are struggling. It's a community where, in my experience everyone wants you to succeed. People are genuinely pleased when you do well and always encouraging and have useful suggestions. We also have plenty of laughs. I have worked in 2 very busy public sectors, I was a nurse for nearly 20 years and a teacher for the last 10 years. The was never any recognition of achievements - certainly in teaching it was always about what you could do better, your best even if outstanding was never good enough. 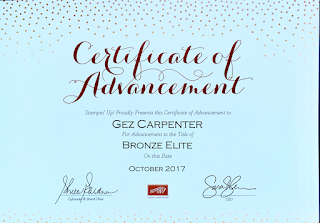 So to have a certificate that is also accompanied by a financial reward and also receiving a gift from my Upline was a real change and one that was greatly appreciated. I probably work more hours now than I did in my previous jobs but I am now working for me and have a huge community behind me and I love it. I also love the fact that I can get to buy things before they are released and am currently enjoying my pre-order from the Spring catalogue an designing things to share with you in January. I can't wait!